The TOPHER Crypter virus is among the most dangerous hacking tools of late. It provides the most advanced infiltration options and can completely take over the victim computers leading to further virus infections. In the majority of cases may not even know that their system have been impacted. Read our in-depth guide to find out more about it. Short Description The Topher Crypter virus is an advanced malware that can cause a lot of system damage connected to the user’s data. The built-in Trojan capabilities can also overtake control of the compromised machines. Symptoms In many cases the victims may not experience any symptoms of infection. User Experience Join Our Forum to Discuss Topher Crypter. Computer hackers have devised a dangerous threat called the TOPHER Crypter virus which is currently being sold on the underground hacker markets. This is a malware that is rated as extremely dangerous by the security community. It is being sold using a subscription package release model which means that the users that wish to use it must pay the criminal developers for access. Right now there are three standard subscription packages: two, four and six month accesss. The hacker operators can also devise a customized version for the price of $50. They note that every crypto currency is accepted as payment mechanism. When the relevant packages are purchased the hacker operators can use different tactics in order to spread the samples. Usually there are main methods of classification — direct intrusion attempts and indirect payload delivery. The hackers can attempt to intrude onto the target networks by performing penetration testing campaigns. This is usually done by loading popular exploits against commonly used software in automated frameworks. If a vulnerability is detected the application will automatically abuse it and install the TOPHER Crypter virus samples. Hyperlinks — These message attempt to manipulate the users into downloading or executing the malware file from a third-party site. Usually they are disguised as files of user interest. Direct File Attachments — Emails of this type use social engineering tricks in order to convince the users into opening up the file attachments that are part of them. The files are usually executable files or password-protected archives. The hacker senders can include the relevant password in the body contents. Following these two mechanisms criminal users can also make use of two popular delivery tactics that are used in conjunction with the above mentioned strategies. The first one makes use of infected software installers of popular software. The hackers download the legitimate files from the official vendor sites and then modify them to include the malware code. The relevant files are then linked or attached to email messages or distributed using email messages. The criminals can also opt to use fake download portals that appear as legitimate web services or file sharing networks that use P2P techology like BitTorrent. A similar tactic is the creation of malware documents. They can be of different types (rich text documents, spreadsheets or presentations) that include malware scripts. Such files are typically modeled to appear as legitimate contracts, invoices, letters and notifications of user interest. As soon as they are opened by the victims a notification prompt appears. It asks them to enable the built-in macros (scripts). As soon as this is done the virus is downloaded from a remote location and executed on the target system. Another TOPHER Crypter virus is the use of browser hijackers that represent malware browser plugins. They are programmed to redirect the users to hacker-controlled sites and can even infiltrate the software repostiories using fake developer credentials and user reviews. Such plugins are usually made for the most popular browsers: Mozilla Firefox, Google Chrome, Microsoft Edge, Opera, Safari and Internet Explorer. The Topher Crypter virus is devised in order to infect the victim computers on a very deep level. The hackers allow the buying customers to customize certain configuration variables and to toggle the available options on and off. Subscription-based delivery also gives the operators access to a web-based dashboard from where they can see in real-time the impacted hosts and overtake control of them. TopherCrypter is Not “just another encrypter” on market. Instead, Topher Crypter is a Real ADVANCED crypter in terms of Crypting Engines and Coding Quality. It is a product of mind-grinding coding work over a period of four months. 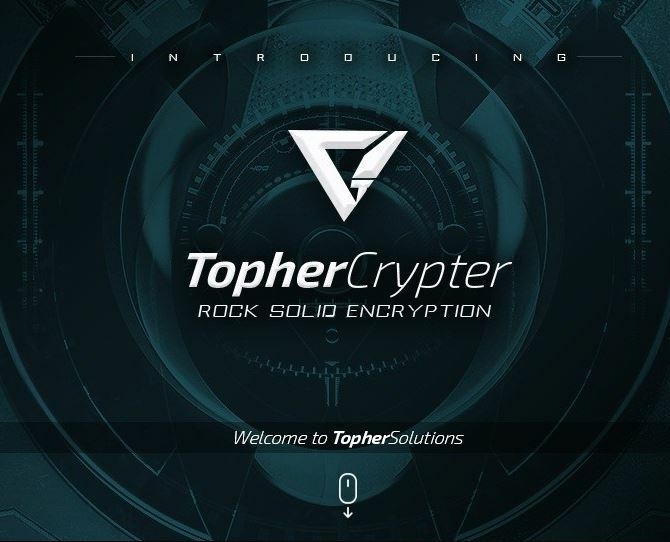 Topher crypter securely protects and encrypts your private binaries, files, data, etc. If you purchase Topher Crypter, we can ensure you that you will receive a High Quality product. And top notch customer support will also be provided to you whenever you need. Advanced infiltration tactics include a custom startup modification that modifies the boot settings and several related configuration files. This prevents the victims from entering the recovery menu and is a vital part of the persistent state of execution mechanism. It essentially modifies the system in such a way that prevents manual removal attempts. This state of execution also protects the malware from any user or software interference. The malware is built on the .NET framework and is compatible with all contemporary versions of the Microsoft Windows operating system. In addition to everything else the main malware code can be changed between attack campaigns making detection very difficult. The Topher Crypter virus sample is able to institute a stealth security which uses an information gathering component to uncover any anti-virus engines, debugging or sandbox environments. If any of them are found the real-time engines can be bypassed or even deleted. In certain cases the hackers can program the strains to delete themselves if they are unable to bypass the security software. The virus is capable of hooking up to system processes and acquiring administrative privileges which makes it capable of launching its own processes as well. During the infection phase the victim remains unaware of the infections. Usually applications that seek out to gain administrative privileges during the firsts tage of infection. At this moment most of the viruses span an user access control (UAC) prompt which is combined with some sort of a social engineering trick to manipulate the users into enabling it. In this particular case however no such prompt is created as the code uses a custom deep injection mechanism that bypasses this option. As a result the users have no way of knowing that they are infected. File Size Changer — The malware has the ability to enlarge the size of individual files in iterations of KB’s or MB’s. File Binder — The malware can bind itself to any file of the hacker’s choice. Icon Changer — The malware can change the graphical icons and file extensions of any data. Encrypter — Designated files, whole folders or partitions can be encrypted using a strong algorithms in a similar way to ransomware viruses. The encryption engine is one of the most dangerous components of the Topher Crypter virus as it uses a a randomly-based encryption pass generator instead of a generic algorithm. This makes it very difficult to recover the affected data. We remind our readers that the malware engine does have the ability to impact the system in a wide variety of ways. In connection with the encryption phase the Topher Crypter virus can remove the Shadow Volume copies of all discovered data. This makes it very hard to restore the affected data without the use of a professional data recovery software. In addition the virus can interact with the Windows Volume Manager which allows the virus to access removable storage devices and network shares. Anonymous Data — This type of information is related to data that is being used by the hacker operators for statistical purposes — time and date of infection, hardware components and operating system data. Personal Data — This type of information is harvested by the engine in accordance with the preprogrammed instructions. This includes the victim’s name, address, telephone, email, location, preferences and passwords. A network connection is made with the hacker-controlled command and control (C&C) server which allows them to overtake control of the victim hosts using a Trojan module. They can also actively spy on them as well as deliver additional malware. Once all relevant components have complete the hacker controllers can blackmail the victims by spawning messages as application frames. The virus can receive updates to its code automatically from the hacker servers and the operators can rely on support via forums, chats and personal messages. Q: How Do I Remove TOPHER Crypter Malware and How Do I Protect Myself In the Future? A: In order to remove TOPHER Crypter virus, you should first stop the malicious processes of the malware by entering Windows Task Manager and stopping the malicious task by right-clicking on the TOPHER Crypter process and clicking on End Process or End Process tree. This results in the virus stopping to mine. After doing so, you may want to remove the malware preferably by following the automatic or manual removal instructions below, if you have removed malware manually and have the experience. Be advised that security experts strongly recommend to remove the TOPHER Crypter malware automatically by downloading an advanced anti-malware software, that aims to scan for and erase all malware from your system plus protect it against future infections as well. Threats such as Topher Crypter may be persistent. They tend to re-appear if not fully deleted. A malware removal tool like Combo Cleaner will help you to remove malicious programs, saving you the time and the struggle of tracking down numerous malicious files. Threats such as Topher Crypter may be persistent on your system. They tend to re-appear if not fully deleted. A malware removal tool like SpyHunter will help you to remove malicious programs, saving you the time and the struggle of tracking down numerous malicious files. Note! Your computer system may be affected by Topher Crypter and other threats. SpyHunter is a powerful malware removal tool designed to help users with in-depth system security analysis, detection and removal of threats such as Topher Crypter. 1. Install SpyHunter to scan for Topher Crypter and remove them. 2. Scan with SpyHunter, Detect and Remove Topher Crypter. Ransomware infections and Topher Crypter aim to encrypt your files using an encryption algorithm which may be very difficult to decrypt. This is why we have suggested several alternative methods that may help you go around direct decryption and try to restore your files. Bear in mind that these methods may not be 100% effective but may also help you a little or a lot in different situations. Note! Your computer system may be affected by Topher Crypter or other threats. Remove Topher Crypter by cleaning your Browser and Registry. Fix registry entries created by Topher Crypter on your PC. Combo Cleaner is a powerful malware removal tool designed to help users with in-depth system security analysis, detection and removal of threats such as Topher Crypter. Step 5: In the Applications menu, look for any suspicious app or an app with a name, similar or identical to Topher Crypter. If you find it, right-click on the app and select “Move to Trash”. Step 6: Select Accounts, after which click on the Login Items preference. Your Mac will then show you a list of items that start automatically when you log in. Look for any suspicious apps identical or similar to Topher Crypter. Check the app you want to stop from running automatically and then select on the Minus (“–“) icon to hide it. Remove Topher Crypter – related extensions from your Mac’s browsers. A pop-up window will appear asking for confirmation to uninstall the extension. Select ‘Uninstall’ again, and the Topher Crypter will be removed. When you are facing problems on your Mac as a result of unwanted scripts and programs such as Topher Crypter, the recommended way of eliminating the threat is by using an anti-malware program. Combo Cleaner offers advanced security features along with other modules that will improve your Mac’s security and protect it in the future. Hey !, I found this information for you: "Topher Crypter Virus — How to Detect and Remove It from Your Computer". Here is the website link: https://sensorstechforum.com/topher-crypter-virus-detect-remove-computer/. Thank you.